However, with the unpredictable economic status, SEW and social upliftment programmes alike have been faced with the wrath of climbing costs, totaling the qualification fees per SEW learner at around R25 000. This means, in order to reach their employment goal of 170 women by 2018, SEW will need to raise an overall amount of R2.9 million to make the kind of big change Sorbet is committed to championing. 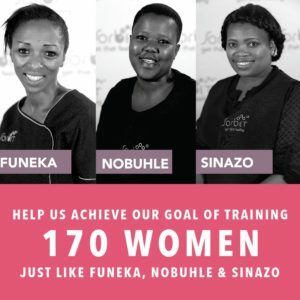 Our goal is to empower 170 women through the Academy across Cape Town and Johannesburg into stable, permanent employment as professional nail technicians by 31 March 2018. We need to raise R2.9 million over the next year so every Rand helps! The Sorbet Empowering Women (SEW) Academy is the result of a deep collaboration between Sorbet and The Clothing Bank, a social enterprise focused on up-skilling and empowering unemployed women to social and financial independence. The Academy recruits, trains (combining technical beauty accreditations with important soft-skill interventions), mentors and coaches, and ultimately secures employment opportunities for successful graduates within the Sorbet Group. An intensive screening process consisting of 2 full day workshops and one-on-one interviews, ensure the candidates selected for the Academy are motivated, committed and focused. These screening tools have been specifically developed for the SEW Academy and include practical problem-solving exercises, group scenario-base activities and individual life-story accounts to test for the qualities and characteristics that we believe our candidates need to be successful. Once registered at the Academy, candidates receive accredited mani and pedi training from The Beauty Therapy Institute. In addition to the technical training, soft-skill development is provided to groom candidates to understand the behaviour, conduct, skills, thinking and approach required to thrive in a professional environment. We also incorporate life coaching into the training journey. The candidates receive 2 hours of coaching every second week throughout their time at the Academy. Once all training and practical hours are complete, candidates are trade tested and offered employment within a salon. The entire journey is a 15 month commitment (including the initial 4 to 6 months of training) which enables us to further mentor our graduates during their first year of employment and meet the end goal of sustainable job creation and retention. Bertha’s smile says it all. The luminescence in her laughter, the sheer giddiness in the pitch and tone of her voice – spilling like honey in sweetness when she shares her story – tells you everything you’d need to know, even without seeing it for yourself. She’s found, and is living in, her bliss. And, as Bertha puts it, “like a miracle”, it was Sorbet that not only opened but unlocked the door to her dreams. Her SEW (Sorbet Empowering Women) story started when she was at a friend’s home, helping her paint her nails. Passionate about beauty since Grade 10, Bertha had found the time to train herself – and learn what she could – through short courses and YouTube tutorials. When Bertha finished Matric and wanted to study Beauty professionally, it was simply an impossible desire that neither she nor her family could afford. Her friend forwarded her information on SEW. Bertha couldn’t believe that this could be the golden ticket to the life and career she had only ever imagined. For Bertha, beauty has always been something that has made her feel confident and special, from the inside. When she was younger, she suffered from low self-esteem owing to being skinny, and being constantly badgered about not eating well, or being unhealthy. This ongoing judgement left Bertha often feeling embarrassed, defeated and anxious about how the world perceived her. But after her first born, with a little bit of extra weight, she had her own “a-ha” moment: “I realised: I am beautiful – just the way I am,” Bertha says. Within her, she felt beautiful, inspired and ready to give more back to the world. She knew she could – and had a deep desire to – make other women feel beautiful too, and gain the same confidence in themselves. Arriving at the first round of SEW registrations and interviews, and waiting among many other passionate women, Bertha experienced the extremity of two emotions- excitement and fear. “But I told myself: stop being scared. This is my opportunity. This is my time.” Turning fear into sheer joyfulness, and radiating positivity, she made it to the second and then final round, and could not have been more elated by being accepted into the SEW programme. 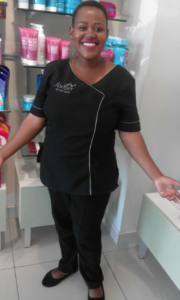 Two years later, as a qualified nail and beauty therapist working at Sorbet Carlswald in Midrand, Johannesburg, Bertha says, “I’ve learned so much. All the skills I’ve learned, through all my training at SEW, has made me the woman I am today.” She lists these skills easily and with well-deserved, self-earned pride. “Sorbet changed my life. I feel I can face the world alone now. Two years ago, I was just a young, naïve girl – now I feel I can do anything,” she adds. Bertha feels lucky enough to have been able to complete her Nail Technician qualification at the SEW Academy. She is aware that a lot of hard work from the SEW partners and financial support from Sorbet guests is a mammoth contributing factor to her achievement. While the SEW programme is reliant on community support, Sorbet, the Clothing Bank and SEW Academy teams are working tirelessly in the wings, at ground roots level, to deepen the foundations of skills support and emotional support, to help South African women gain the skills they require to be financially independent. 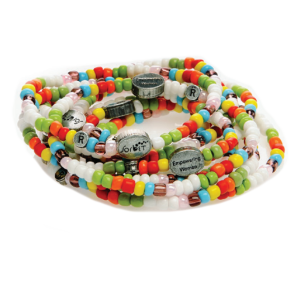 With its mission firmly set in place, SEW aims to secure the employment of 145 women by March 2018, which is a remarkable goal – and a foreseeable achievement with the added help of Sorbet’s community and guests now volunteering to purchase a SEW bracelet – or simply by adding just R2 to their treatments, as a SEW contribution. “Beauty School is so expensive: so much so that it’s difficult for many people – including me – to afford the fees. This opportunity was like a dream come true, like a miracle, and I just want the chance to say thank you,” says Bertha. It is women like Bertha Sibanyoni that inspire verve and dynamism in young women that want to change their circumstances for a better, more soulful, more purposeful destiny. With Sorbet on their side, it’s a pretty beautiful ride. When Courage Roars from a Woman, it shall Inspire a Nation. Growing up in a small rural village just outside Giyani Limpopo, Pamela was certain that these circumstances would not become her limitation. With a lack of resources and technical knowledge about any industry, Pam resolves that she will fight against all odds, she will prove the disbelievers wrong and in the end, she will arise victorious! Paving a cobblestone path to her dream of becoming a beautician, Pamela becomes a self-employed hairstylist and progresses after that to taking part in a Hospitality course in Grahamstown, where she gains the experience to work in the city of lights, Johannesburg. 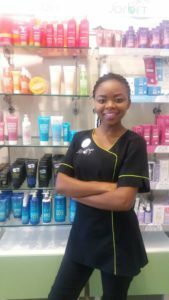 Her receptionist job in Sandton gets her by, but her interest in the beauty industry never leaves her. By cleverly utilising the resources Pamela had available to her, she began teaching herself how to creatively and professionally apply makeup by watching online tutorials. This worked. She grew her clientele and realised that this is what she truly had a knack for. Public perception has it that young girls that complete their Matric are meant to have the world as their oyster but this sadly isn’t the case for most young South African women since many lack the knowledge and resources to take charge of their lives and empower themselves – which is exactly what Pamela defied when she joined SEW. “I’ve always known about Sorbet but never thought in a million years that I’d be employed there!” Pamela exclaims with excitement. It is at the SEW Academy that she says she’s learned the most and met women who will be her friends and support system for life. “When I first met Lisa from SEW, I knew that she would be a blessing in my life.” Pamela feels grateful for being able to work with SEW co-ordinator, Lisa Mgcotyelwa, because she inspires the ladies to work on their inner selves before polishing their outer person. At a tender 24 years of age, Pamela is a role model to these young girls and all role models have goals they are constantly working on to better themselves and others too. Knowing what Pamela has in store for the next five to fifteen years has truly set the bar high. She will continue to pass down her inspiring stories to the young women of today who, like Pamela, will not be afraid to roar with the power of beautiful pride. For Pamela, her dream is far from a solo affair. Through her persistent financial support, Pamela wants to see her 3 year old son, Ntsako exposed to the best educational opportunities and securing his future by setting up an educational trust fund for him. Born to a line of independent women, she also cannot wait to see her younger sister graduate with her BSc from the University of Johannesburg next year. Furthermore, Pamela is excited to help her tenacious mother complete her Honours Degree in Information Science at the age of 45. “All of this is possible thanks to my stable job at Sorbet.” She says in closing, with warmth and appreciation. And suddenly, as I begin to appreciate what it is to be Pamela, fifteen years doesn’t seem like a long shot. Zelma was one of the first of four graduates to complete her training as a qualified nail technician through the SEW Academy, in partnership with The Clothing Bank. Having originally wanted to study engineering, a career in beauty was a vast departure from her initial ambitions but in brightly-coloured pots of gelish, amidst UV lights, the creativity of nail applications and, most of all, the happiness she finds in interacting on an hourly basis with her clientele, Zelma has not only found her calling in life but a place of belonging too. Zelma’s story began when she approached The Clothing Bank a social enterprise focused on up-skilling and empowering unemployed women to social and financial independence. At that time, the social initiative available was selling clothing – and was restricted to mothers only. This was hard news for Zelma as, with no children of her own, it meant she wasn’t able to participate. This is when she mentions previous SEW Academy Manager and now Managing Director of the Amazi beauty brand, Divya Vasant, as the person who truly journeyed with her. “Divya was the one who saw the potential in me, and helped me get to where I am today.” As Divya began working closely at the time with passionate, capable women like Zelma, an inspired partnership was setting in the wings. Zelma was one of the very first learners to train through the then newly established SEW Academy in 2014. She admits that the ride wasn’t always smooth – with challenges, obstacles and hurdles that needed to be overcome, as well as processes and procedures that needed to be fine-tuned within and by the SEW Academy “But even so, I wouldn’t have changed this journey for the world,” she adds. After a short stint of running her own beauty store, Zelma found permanent employment at Sorbet The Point, where owner Mandy Metz was integral in her journey – another woman she deems a change maker in her life. “I never imagined myself becoming a nail technician, but this is definitely the industry for me. I love what I do and I’m good at it too,” she smiles at me, and I get that wholesome all-too familiar fairytale feeling. Beyond happiness, beauty and life skills, employment and a whole host of life-changing, character-expanding experiences, perhaps the most exciting thing that the SEW journey has given Zelma – for the first time in her life – is the capacity and the courage to dream, and dream big. Use our graduates to host a pampering corporate wellness/business event – contact us to learn more about our Academy pop up concept.